Our Classic Cement Tiles continue to be hot. Different Classic Cement Tile patterns take the top two spots this week. And, a favorite for pool sideboards, a panel from our Reef Mural maintains the #3 position. Classic Alhambra Cement Tile (Colorway A) 8" x 8"
Mediterranean style is captured at this Pacific Coast resort using the San Tropez cement tile pattern from the Classic Collection. The San Tropez cement floor tile illustrates how four or more tiles are grouped together to create a pattern. The foyer creates a sophisticated and grand statement that is both beautiful and durable. The lobby was completed using 8"x8" tiles with the pattern (or field) stretching the entire length of the room. Tile colors include blue, mustard, white and gray. Cement tiles are extremely durable and easy to care for. A single San Tropez cement tile design and the resulting pattern when grouped together. Because the tiles are not fired and they are extremely durable, cement tiles are a green product. Using these tiles makes a smaller carbon footprint and reduces total ownership cost over the project life. You can install cement tile in all indoor residential and commercial locations including vertical and horizontal applications. Cement tiles can be used on floors, walls, back splashes, lobby or kitchen counters, bathrooms and ceilings. Cement tiles are not frost proof and are not suitable for outdoor locations that are subject to freezing. Cement tiles may be installed in outdoor or indoor swimming pools. Make sure to use the manufacturer's recommendation for sealing. Ask us for details about your project before you begin. Cement tiles are handmade, one tile at a time. This makes each tile unique and different. To achieve a better blending of the material, we recommended that you pull tiles from different boxes at random to achieve the look you desire. 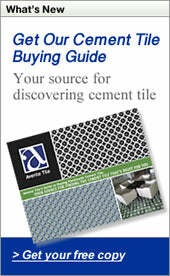 View our line of cement tile or call us toll free at 888.739.4972 (9-5 PST M-F). We love to talk tile. Color. We love it when it works. Hate it when it's wrong. You can always repaint the room; but you can't do that with tile. The intricate patterns with multiple colors found in handmade cement tile and especially many of our Cuban Heritage cement tile are amazing. I often hear, "I love this tile. But, what colors would I use this with?" One solution I used to offer folks is, "Here's the colors used to make the pattern." Helpful, but that doesn't really answer the question. I want to make sure you love, can live with, and grow with the color palette (and the pattern). Remember, Cement tiles are amazingly durable and will last the life of the home. There are two very helpful online tools. They offer flexibility in creating a color pallet to help you decide if the tile is going to work for you. All you need to do is enter the url of the image of the tile and the Color Palette Generator will show you the colors and their Hexadecimal Color Codes for HTML (used by web designers to create colors for a web site). Color Hunter allows you to create and find color palettes from images as well. Once you decide on the colors, you can use that to help you find paint matches and to finalize other color decisions. Here's an example using one of my favorite tiles the Cuban Heritage Design 110 2B. Have fun and create a tile and color palette you love. The new additions to our Classic Cement Tiles are hot. We added nine new designs and they quickly climbed to the top of the list. Here are the most visited product pages at Avente Tile. Classic Cluny Cement Tile (Colorway A) 8" x 8"
What is Cement Tile Polishing? When cement tiles ship from the factory, they can be "polished" or "unpolished". Here are answers to the most frequent questions about polishing cement tile. Polishing is a mechanical process that uses a high-speed rotary buffer, mild abrasives and water to "polish" each cement tile. The process simulates the "patina" a cement tile might develop after years of being cleaned with wax and water. Are polished tile really shiny and slippery? No. Polished tiles have a moderate, flat satin look and are not as rough to the touch. Polished cement tiles are acceptable for floor applications. It should be noted that while the coefficient of friction of a polished tile is within the acceptable range of slip resistance, it is different than that of the unpolished tile. Will polished tiles have a longer life? No. Polishing the tiles does not increase the life of the tiles. Do polished tiles require more maintenance since high-tread areas will wear down the "polish" and produce "walking lanes" over time? No. Factory polishing is not like wax on a hardwood floor. The factory polishing process does not create a "layer of polish" on top of the tiles. If not properly maintained, tiles may develop shiny "walking lanes" in high traffic areas. To avoid this problem make sure the floor is evenly maintained and cleaned. What is the advantage to polishing tiles? Once installed, the tiles immediately create a "lived in" feel with a softer satin sheen. This same effect will occur with normal care over time. Watch Cuban Heritage Cement Tiles being factory polished. Avente Tile thanks the kind folks at Aguayo Cement Tiles for sharing their insight about polishing and allowing us to tour their cement tile factory and video tape the polishing process. Outdoor living rooms are one of the most popular amenities in today's back yard. More Americans are entertaining outdoors than ever before. And why not? Learn how you can create the perfect intimate outdoor room with a wonderful view! Sip your favorite rosé, roast pork tenderloin on the grill, and enjoy the sunset with friends. This is one of my favorite outdoor living rooms in California. It uses beautiful tile, natural stone, and stained concrete around a cozy fire and eye-catching mural. Notice that high walls on two sides really help the patio feel like a room. Natural stone, like flagstone (shown here) or slate maintains the built-in garden color scheme. The strategic use of flagstone on seating areas, the mantle, and for edging along the patio is stunning. This also provides the right balance between beauty and cost. Stained concrete is a great choice for most of the patio floor and gives a natural look at a fraction of the cost. The pergola provides a transition from the house to the open outside living area. A well-designed space needs a focal point. In this room, the fireplace commands your attention! I love the warm, deep-red sangria color tiles around the hearth. It's warm and inviting even if the fire isn't lit. You need to grace your outdoor living space with fine art. The Pomegranate Tree Mural is the piece de resistance in this outdoor living space. The tile mural provides the artwork in this outdoor living room and maintains a stylistic nature theme. Chosen for durability and color, the outdoor kitchen countertop uses a high quality hand-painted vitreous tile resistant to chipping. Blue Celadon is a great color for outdoor living spaces because it harmoniously blends sky and earth tones. This color pairs nicely with the brown tones of flagstone. The natural beauty of hand-painted glazes are ideal in an outdoor setting because the colors vary from tile to tile. The best part of living in an outdoor space is enjoying the view. 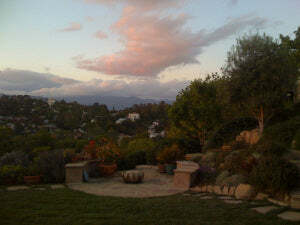 And, you can't beat this view of the hills from Los Angeles's Echo Park retreat. Sit back, relax and enjoy! 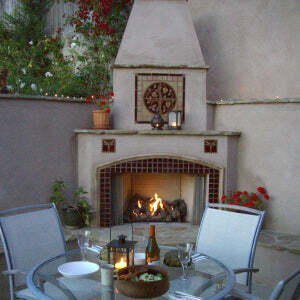 Tile creates the perfect outdoor living space. Read more more about this project at the Casa Lucretia blog. Photos courtesy of Tom Chatt.